A suffix found on nouns borrowed from Latin; especially, derivatives of verbs (odium; tedium; colloquium; delirium); deverbal compounds with the initial element denoting the object of the verb (nasturtium); other types of compounds (equilibrium; millennium); and derivatives of personal nouns, often denoting the associated status or office (collegium; consortium; magisterium). This ending of -ium also occurs in scientific terms on a Latin model; such as, in names of metallic elements (barium; titanium) and as a Latinization of Greek -ion (pericardium). A community of beach-dwelling organisms. Sediment consisting of mud, sand, silt, gravel, and other unconsolidated detrital matter that is carried along and deposited by flowing water: The largest alluvia tend to accumulate within the water channel itself while particles of clay, silt, and fine sand are small enough to be suspended as the water continues to flow. When the watercourse overflows its banks, these alluvia can be distributed across a valley floor where such an overbank or flood deposits have become the most common areas in which buried archaeological sites are found. Some valley-stream areas are composed of deposits of alluvia and those are the places where researchers often find buried archaeological treasures. A flower or a portion of a flower. Information is located at Chemical Element: barium. Information is located at Chemical Element: beryllium. 1. In Roman times, an ox skull that was carved in relief and was part of the decoration of a building. 2. A sculptured ornament, representing an ox skull adorned with wreaths, etc. Information is located at Chemical Element: cadmium. Information is located at Chemical Element: chromium. 1. In architecture, an individually owned unit of real estate, especially an apartment or townhouse, in a building or on land that is owned in common by the owners of the units: Jim told his friend that he intends to buy a condominium before he retires because he is tired of renting an apartment. 2. A building or complex containing apartments or townhouses: The condominium on the corner has a great view of the ravine and river that is just across the street. 3. In politics, a country governed by two or more different countries with joint responsibilities: The countries on both sides of the river agreed to a condominium so that neither one would have sole ownership of the river and the commerce that used it. 4. 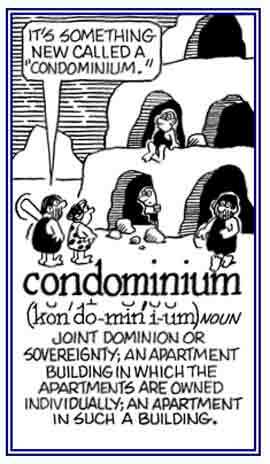 Etymology: from Modern Latin, "joint sovereignty", apparently coined in German about 1700 from com-, "together" + dominum, "right of ownership". The sense of "privately owned apartment" came into existence in American English, about 1962, as a special use of the legal term. A building and/or furnace where dead bodies are incinerated.